This episode highlighted relationships between men and women. 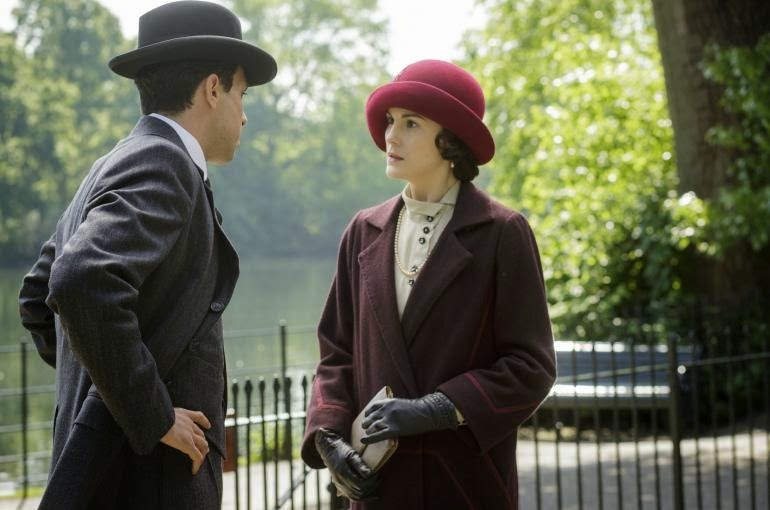 Rose's father came to Downton with news of his upcoming divorce. Tension built between Robert, Cora, and Simon Bricker, as Bricker continued to flirt with Cora. Violet looked for her Russian Prince's lost wife. Edith worried about Michael's disappearance after he was bullied by brownshirts in Germany. Isabelle received a proposal from Lord Merton, which she is considering. Mary flirted with Charles just before she tried to turn down Tony's proposal. Tony refused to accept her rejection. In other news, Barrow took a mysterious drug, as Baxter worried about him. Anna visited Piccadilly, where John Green was killed. Robert had problems with modernization, including a discussion with Tom and Mary about building houses on the property and a conflict with Sarah Bunting. During the dinner conflict, he called Daisy and Mrs. Patmore to the dining room to quiz Daisy about Sarah's tutoring. On a happy note, Isis appeared in several scenes. Downton needs more Isis scenes! I am not a great fan of Robert -- I find him stodgy and stubborn. But he was the focus of a lot of attention and conflict this week, so I will give him the Character of the Week title. Mary chose a statue of Peter Pan in the park as a meeting place to break off her engagement to Tony. The juxtaposition of the happy childhood statue and their conversation was striking. Tony's refusal to accept Mary's rejection surprised me. He has been such a little puppy dog with her up to this point. I hope Daisy will continue her education (go, Daisy!). I hope that Mary will continue to flirt with Charles -- they have great chemistry! I hope Tom will stay at Downton and turn away from Sarah. I hope Edith will stop moping and tell the truth about Marigold. How about you? What did you think of this episode? What should happen next? I find myself hoping Mr. Barrows is diabetic, which is an odd thing to hope for anyone, but I don't like the alternatives......I expected the difficulty with Tony. Mary did not think far enough ahead. I wonder whether he can blackmail her since the repercussions were so much worse for a woman/lady in that era than they were for a man....I want the Bates conflict to be OVER. In a good way...I feel a bit cranky with them all this week. Disgruntled. I did like Robert telling Mrs. P that he agreed with her and seeing that that acknowledgment helped her feel better, and I did like Daisy offering to write a letter to the war office for Mrs. P. I think the letter would not change anything as far as names on memorials since the men were not pardoned until quite recently, but I like Daisy mustering her wits in her own defense. I do not like Miss Bunting and her very poor judgement and unkind agressive ways. She is very young. Kristi, thank you for your comment! I had not thought of Mr. Barrow being diabetic; I also do not like the alternatives. If it turns out that these drugs are some type of "therapy," my heart is going to break a bit for a character that I do not like. YES about the Bates conflict. The Bates/Anna drama has dragged on far too long. I also think Tony may try to blackmail Mary. I felt like she did not really take his anger and sort of veiled threat that seriously this week. Love your description of Miss Bunting as "very young." That is kindly put and so accurate as well. LOTS to think about in each episode, isn't there, Trish? I think Edith and Mary need to go away though they likely won't. They both need a change. It's impossible for Edith to get on with life while estranged from her daughter in such close quarters and Mary's situation with Tony is about to become very uncomfortable. I hate to see Tom go but maybe he will. I am not crazy about Sarah either but I also don't like how he's suppressing some of himself at Downton. Maybe he will settle out in the middle and not be extreme. Maybe those characters could all immigrate to Canada and start a new show here, LOL? I'm not a watcher of DA but so many people have recommended it to me that I'm determined to sit down and start! It sounds great! Downton Abbey is the best! Those Brits always have the best shows! Ok, so I'm still trying to figure out what exactly Mr Barrow is taking the drug for!!! Robert Robert. He is so so stuffy. I agree the Bates conflict is getting so tired. They are so boring now! And Mary's situation with Tony will NOT end well! I never really like Tony, wasn't sure why, but I now do! I hope Mary breaks it off and goes to Charles, they do have great chemistry! I do not like Ms. Bunting, I understand her wanting to question things, but she was being incredibly rude either way! Excited to see next week's episode! LaShawn, I agree that Tony and Mary will not end well. He is way too obsessive. Erica, I also hope that Mary starts to see Charles. They do have great chemistry. I'm looking forward to next week's show, too!